How Far is Mehta's Pritee? Mehta Havens was born out of the dream, vision and burning desire of a young person in his early twenties from Chennai,. Mehta Havens Group takes pleasure to presents its residential project “Pritee”, a place where you call it a home.Pritee which is strategically nestled at Chennai with all the comforts and essentials of an Urban Lifestyle. Customer designed bathrooms, aesthetic landscaping, professionally designed & planned homes. Smooth finish emulsion paint customized to your requirement. Vitrified tiles, branded bathroom fittings. Approved cabling & moulded switches. Granite kitchen platforms & stainless steel sink. American moulded door for main door. Potential saving of 10% on power bill by a well lighted house - design of sunshade - intelligent layout - direction of windows. Swimming pool and lots of entertainment area. We have been in the construction business for 40 yrs and completed more than 40 projects of about 5,00,000 sqft for 600 satisfied families. Our prime objective is to provide our clients deluxe amenities & ultimate comfort through economical design. We ensure maximum utilization of spaces & aesthetic elevation. To make an owner proud abouthis house is our top most priority. 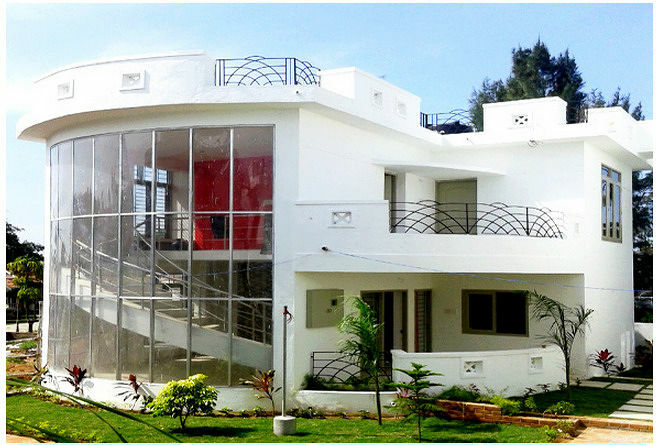 All our projects are designed by an Architect with emphasis on efficiency of design in conformity with Vasthu Sastra.